With today's release of Q4 GDP stats, we have our first look at corporate profits for the quarter, and once again they were higher. 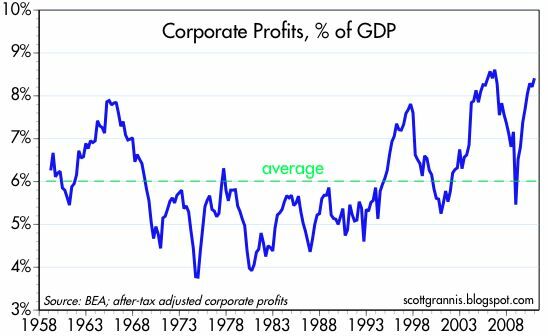 After tax corporate profits rose 13.7% last year, and now stand at 8.4% of GDP, substantially higher than the 6% average ratio of profits to GDP since the data have been collected. Since 1999, when the S&P 500 first reached its current level of 1320, corporate profits have more than doubled. By that metric stocks have lost half their valuation over the intervening years. The chart above creates a PE ratio for the S&P 500 by using after tax corporate profits from the National Income and Product Accounts as the earnings. Here we see that PE ratios, currently about 12, are substantially lower than the long-term average of 15.7. All of this suggests that at the very least, equities are not over-priced, inflated, or in bubble territory. Equities are cheap by these historical metrics, which implies that the equity market is priced to some very conservative and/or pessimistic assumptions. Ditto for the bond market, where historically low levels of Treasury yields and expectations for Fed tightening are consistent with a view that the economy will grow very slowly and inflation will remain low for a considerable length of time. Profits have been very strong in the this recovery, but the market is taking nothing for granted. Equities are essentially priced to the expectation that profits will decline by 25% relative to GDP in coming years, which would take the profits/GDP ratio back to its long-term average of 6%. That could well happen, and it makes sense to think that there is a mean-reversion behavior inherent in profits and GDP. But again, it implies that the market is most definitely not over-priced or artificially inflated. Scott - the article in today's NY Times about GE's effective tax rate is interesting. Does it concern you that earnings might be somewhat higher than normal due to this kind of "tax avoidance"? 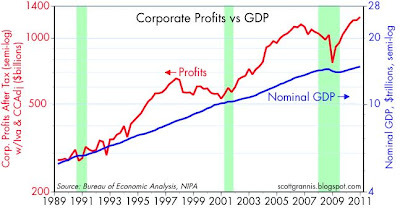 Scott - Has Quantitative Easing played a roll in rising corp profits at all? What do you think will happen when QE2 ends in June - in terms of GDP, corp profits and ultimately the stock market? Doesn't a mean reversion imply strong employment growth?? The private sector, once again, shows that it can innovate, respond, produce more and cheaper. Would that we could shove about 10 percent of our GDP into the private sector, out of the public sector. That said, the impediments faced today by business are probably no worse than the 1960s, an we boomed then, or the 1990s. Bernanke, pour it on, baby, pour it on. 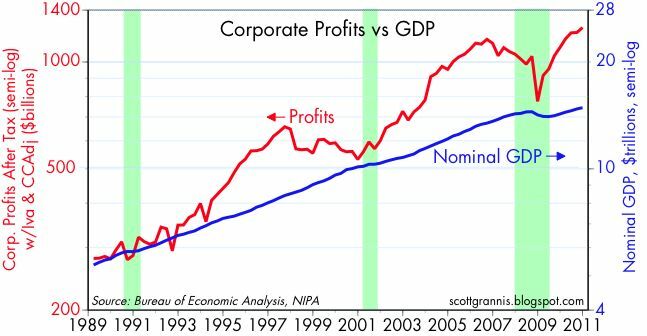 Isn't the rise in Corporate Profits to GDP the result of non-US profits? I think these are in the profit numbers, correct me if wrong. Since non-US have been growing faster for a long time, this would bias the graph. 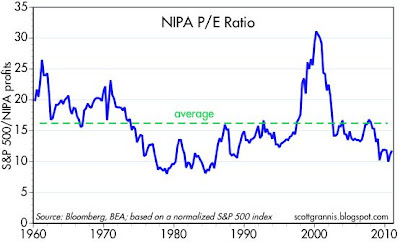 You have posted this chart a number of times and I've been scratching my head asking myself why the big difference between the NIPA earnings and the S&P earnings normally used in the P/E ratio?? Burt: Since the end of 2008, foreign profits have actually risen less than domestic profits. j: re the difference between NIPA profits and reported profits. It's a rather long-winded explanation. But to be brief, NIPA profits are based on information supplied by corporations to the IRS. They are adjusted for capital consumption allowances and inventory valuations. They don't include writeoffs for goodwill. They are as close as one can get to true "economic profits." They are much less volatile than reported profits. NIPA profits are expressed as quarterly annualized numbers. The two measures of profits really are different but over time they have tracked pretty closely. Andy: re GE profits. Here's what I wrote to a friend earlier today on the subject: "High marginal tax rates are a fact, and they create a huge incentive for companies like GE to game the system. The fact that some corporations pay little or no tax is not an argument for higher taxes, it is an argument for lower marginal tax rates. Zero would be best, of course, since those who are economically literate understand that corporations never pay any tax anyway--only consumers pay taxes." In any event I don't think tax avoidance is big enough to distort overall corporate profits. brodero: I haven't seen the California numbers at all, but that sounds pretty interesting. Anecdotally I do see evidence of a California pickup, so I'm not too surprised. smoky: I don't think QE has inflated anything. It hasn't created any new money, it's just swapped short term assets for longer term assets. What it has done is to eliminate deflation risk, and that has allowed equity prices to rise since that is an important move to eliminate future uncertainty. The end of QE should not be a negative event. If short term rates rise that should not be bad for the economy, and it will actually help the consumer, since households have more floating rate assets than floating rate debt. I think the market--especially the dollar--will welcome the end of QE. Too much monetary ease is a bad thing. Better for the Fed to tighten. brodero: re mean reversion. A mean reversion of profits/GDP could imply strong employment growth (e.g., flat to rising profits but very strong nominal GDP), so it's not necessarily bad. But it's also possible that GDP could prove to be weak and profits could decline. scott Sumner contends the a good addition to QE is no more paying of interest of bank reserves, or possibly negative interest on reserves. Kick the banks a little to get them lending. I like that idea, but I worry that banks need to see some more economic growth before they land more. I like a payroll tax cut for a couple years, Social Security. Really, I would like to run a national lottery that pays out more than it takes in, in $200 winning tickets. My ideas do not always gain a lot of traction. Corporate profits do not make their way to shareholders and the average stock is held for 2 months. Furthermore, the stock market is no longer a capital financing mechanism for corporations. Trying to connect stock prices to profits is a fruitless exercise. Your analysis proves this resolutely. Its probably not a condition of fear as much as it is a realization this is a global casino. The fundamentals need not apply. You simply need to ride the waves. I think you are disregarding the global civil unrest on the margin. Eventually the waves will crash on US shores. Scott, Shiller has some p/e ratio that uses trailing earnings. There is also Tobin's q ratio. People assert that these ratios show stock prices to be overvalued. Your opinion? Martin Feldstein, a conservative economist, sings the praises of QE2. CAMBRIDGE – There is no doubt that the American economy rallied strongly at the end of 2010. But how much of that was due to the United States Federal Reserve’s temporary policy of so-called “quantitative easing”? And what does the answer mean for the US economy in 2011? Until the fourth quarter of last year, the US economic recovery that began in the summer of 2009 was decidedly anemic. Annual GDP growth in the first three quarters of 2010 averaged only about 2.6% – and most of that was just inventory building. Without the inventory investment, the growth rate of final sales averaged less than 1%. But the fourth quarter was very different. Annual GDP rose by 3.2% and growth of final sales jumped to a remarkable 7.1% year-on-year rate. True, much of that was due to a sharp decline in imports; but even the growth rate of final sales to domestic purchasers rose at a healthy 3.4% pace. The key driver of the increase in final sales was a strong rise in consumer spending. Real personal consumer spending grew at a robust 4.4% rate, as spending on consumer durables soared by 21%. That meant that the acceleration of growth in consumer spending accounted for nearly 100% of the increase in GDP, with the rise in durable spending accounting for almost half of that increase. The rise in consumer spending was not, however, due to higher employment or faster income growth. Instead, it reflected a fall in the personal saving rate. Household saving had risen from less than 2% of after-tax incomes in 2007 to 6.3% in the spring of 2010. But then the saving rate fell by a full percentage point, reaching 5.3% in December 2010. A likely reason for the fall in the saving rate and resulting rise in consumer spending was the sharp increase in the stock market, which rose by 15% between August and the end of the year. That, of course, is what the Fed had been hoping for. At the annual Fed conference at Jackson Hole, Wyoming in August, Fed Chairman Ben Bernanke explained that he was considering a new round of quantitative easing (dubbed QE2), in which the Fed would buy a substantial volume of long-term Treasury bonds, thereby inducing bondholders to shift their wealth into equities. The resulting rise in equity prices would increase household wealth, providing a boost to consumer spending. To be sure, there is no proof that QE2 led to the stock-market rise, or that the stock-market rise caused the increase in consumer spending. But the timing of the stock-market rise, and the lack of any other reason for a sharp rise in consumer spending, makes that chain of events look very plausible. The magnitude of the relationship between the stock-market rise and the jump in consumer spending also fits the data. Since share ownership (including mutual funds) of American households totals approximately $17 trillion, a 15% rise in share prices increased household wealth by about $2.5 trillion. The past relationship between wealth and consumer spending implies that each $100 of additional wealth raises consumer spending by about four dollars, so $2.5 trillion of additional wealth would raise consumer spending by roughly $100 billion. That figure matches closely the fall in household saving and the resulting increase in consumer spending. Since US households’ after-tax income totals $11.4 trillion, a one-percentage-point fall in the saving rate means a decline of saving and a corresponding rise in consumer spending of $114 billion – very close to the rise in consumer spending implied by the increased wealth that resulted from the gain in share prices. None of this appears to augur well for 2011. There is no reason to expect the stock market to keep rising at the rapid pace of 2010. Quantitative easing is scheduled to end in June 2011, and the Fed is not expected to continue its massive purchases of Treasury bonds after that. Without that increase in stock-market wealth, will the saving rate continue to decline and the pace of consumer spending continue to rise more rapidly than GDP? Will the strong economic growth at the end of 2010 be enough to propel more spending by households and businesses in 2011, even though house prices continue to fall and the labor market remains weak? And does artificial support for the bond market and equities mean that we are looking at asset-price bubbles that may come to an end before the year is over? Only time will tell, of course. But these are the questions that investors and policymakers alike should be asking. Martin Feldstein, Professor of Economics at Harvard, was Chairman of President Ronald Reagan's Council of Economic Advisers, and is former President of the National Bureau for Economic Research. Charles: Re Shiller's PE ratio, it makes no sense to me to use 10-yr trailing earnings as he does. Plus earnings 10 years ago occurred during a time when we were really flirting with deflation caused by very tight money. Before you dismiss Shiller's P/E measure, you should know that his 10-year normalized P/E has great predictive power on future 10 year returns. Have you done any backtesting to see if your so-called "NIPA" P/E is good at predicting future stock returns? By the way, NIPA earnings are not even on the S&P 500 companies. So please stop calling it S&P 500 P/E. Housing prices slid in January for the sixth month in a row, putting them barely above the lows reached in the depths of the recession, according to data released Tuesday.